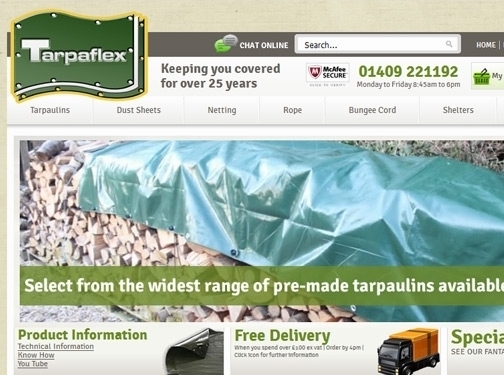 Tarpaflex Ltd, a family owned business with over 20 years experience in the trade, is firmly established as a leading name in polyethylene tarpaulins and dust sheets. Located on an eight-acre site in the beautiful Devon countryside, we distribute our tarpaulin products the length and breadth of the British Isles. In addition we also supply a comprehensive range of dust sheets, poly rope, scaffold sheeting, debris netting and complementary products. UK (Okehampton, Devon) based business - with over 20 years' experience - providing tarpaulins, dust sheets, netting, rope and other accessories for sale. Website includes e-commerce facilities, delivery and returns information, FAQs, full contact details including VAT number. Company website has been online since 1999 according to web.archive.org.